ORDERING: Sales Orders can be placed by phone on +44 (0)1257 473688, or e-mail info@cloud9artdeco.co.uk or by using our online enquiry form to reserve a piece. You can also order in person when visiting our showroom at Unit 12 Douglas Mill, Bradley Lane, Standish, Wigan, WN6 0XF. RE-UPHOLSTERY COMMISSIONS: When commissioning any article of furniture to be re-upholstered, a visit to our workshop is to be preferred in order to discuss your requirements and to choose materials and colours etc. A deposit of 10% is required to secure any item to be re-upholstered or repolished which is non refundable . However, we are prepared to hold the item for as long as is necessary within reason. PAYMENT: We accept Cheques, electronic online bank transfer or cash (if you are sending cash please make sure it is by registered post, we cannot accept responsibility for Post Office mishandling). When paying by cheque please allow 7 days for cheque to clear before goods can be delivered, unless covered by a bankers card. COLLECTION IN PERSON; please remember when paying by cheque clearance time of 7 days required unless supported by a bankers card. Please call to arrange a time convenient to both parties. 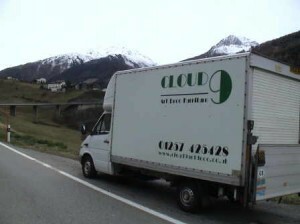 Cloud 9 Art Deco delivering to the Swiss Alps, we get everywhere! CONTACT PHONE NUMBERS +44 (0)1257 473688 Mobiles 07795 622787 /07833 097119 / 07733 363183 You can always be sure to get one of us!